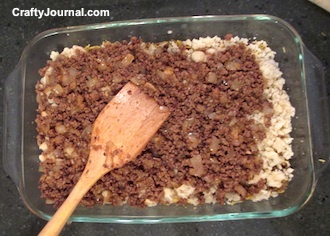 Uncle Carrie’s favorite casserole is made with hamburger and brown rice. 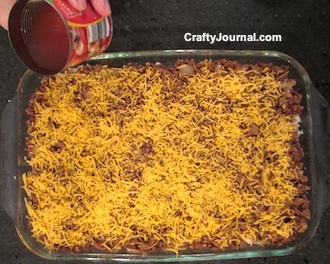 This easy casserole freezes well, and would make a great potluck dish, too. This recipe makes a large amount because we like to have enough to freeze some for future meals. But you can easily cut the recipe down to make less, if you wish. Brown hamburger and add onions and garlic. Cook until nice and brown. Mix in tomato sauce and simmer until rice is ready. then the rest of meat mixture. Fill 1 tomato sauce can about 2/3 full of water and dribble over casserole. Bake 30 to 45 minutes at 365 degrees, until the water is soaked up and casserole looks done. We cook it the longer time as we like it browned. This makes enough for 3 or 4 meals, so we freeze it in quart ziplock bags that we can later just thaw and heat.